In a week where we're celebrating the great and good of British technology, warning shots have been fired by the boss of EE who fears consumers risk being confused about 4G. 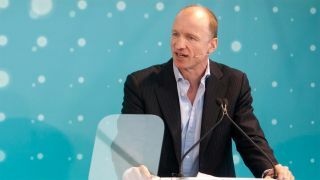 At the end of June Vodafone and EE came to blows over the former's decision to brand McLaren F1 cars with "Ultrafast 4G" livery at the British Grand Prix - and TechRadar has spoken to Olaf Swantee, EE CEO about the whole shebang. "It think it was very bad that Vodafone did that. Why would you put on a car that 4G has arrived? It's the British GP, they have 4G in some other places. It's really confusing customers if you do that," he said. "I would not do that. I would not say today we have this, but it's only actually there in six months or a year from now. I would not do that." It's not just Vodafone who Swantee has a bone to pick with, as Three has also stepped into the EE boss' firing line. "I think Vodafone's ad is confusing, it's frankly not the truth. It's confusing the customers, similar to the Three advertising. Have you seen the Three advertising? 3.9, blah blah blah, 3.9 it's close to 4G. What is that?" There's a deeper ethical issue at play here and it's something that Swantee doesn't believe some of its rivals are considering. "We have an obligation now to be authentic, you have to be in the UK market nowadays. You probably could've got away with it 10 years ago, but not today. "Nowadays I think brands have to be authentic at what they do and I think Vodafone and Three have that obligation as well. I think they are, with their advertising, very, very, very unclear and they are not authentic and real to what they really have." EE is obviously defending its position as the only carrier to offer 4G in the UK at the moment and it's eager to build up its superfast reputation as much as it can before its rivals launch their own LTE services in the coming months.